Mix all the ingredients in a big bowl and divide into 16 to 18 patties, depending on the size. Heat a small frying pan. Add the olive oil, shallot, garlic and ginger. Saute on medium heat for 30 seconds. Add the mango, pineapple, pineapple juice, mango lemonade, apple cider vinegar and brown sugar. Bring to a boil. Lower the heat and let simmer for 20 minutes covered. Turn the heat off and blend the mixture till smooth in a blender. Taste for seasonings and add salt if necessary. Take out in a bowl and let it cool before using it for the burgers. To assemble the burgers, place a burger on the sliced brioche. Spread the chutney on one side with the arugula, slice tomatoes and onions. Place the vegetables on a lined cookie sheet. Drizzle the olive oil and sprinkle the salt and pepper and roast for 35 to 40 minutes or till the vegetables are soft. Take out of oven and scrape off the skin from the poblano peppers as well as the garlic from the foil. Place in a blender or processor and process till smooth. Place the turkey meat in a medium mixing bowl. Add the poblano mixture, salt and pepper and mix well till everything is incorporated. Form into four patties. Let it sit for 2 to 3 hours. Cook on a grill or skillet. 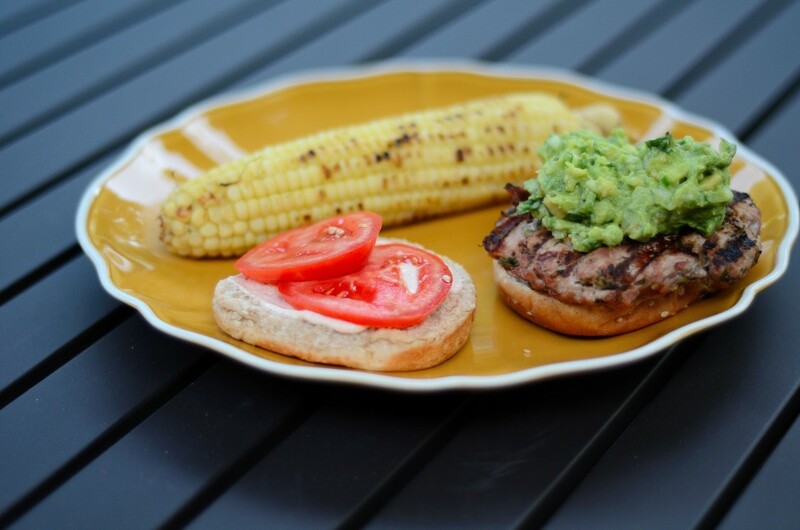 Serve on a sesame seed bun with tomatoes, smoked paprika mayonnaise and guacamole. Add the yogurt, mayonnaise, garlic powder, smoked paprika, salt and lemon juice in a small bowl. Mix well and keep aside. 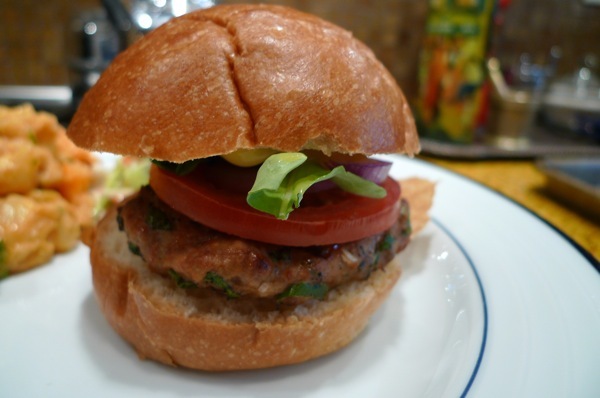 We love, love burgers and this is a delicious one with yummy flavors of green onions and lots of herbs! Place the herbs and green onions in a food processor. Process till smooth. Take out and transfer to a mixing bowl. Add the meat, egg and salt. Mix well and form 4 to 5 patties. 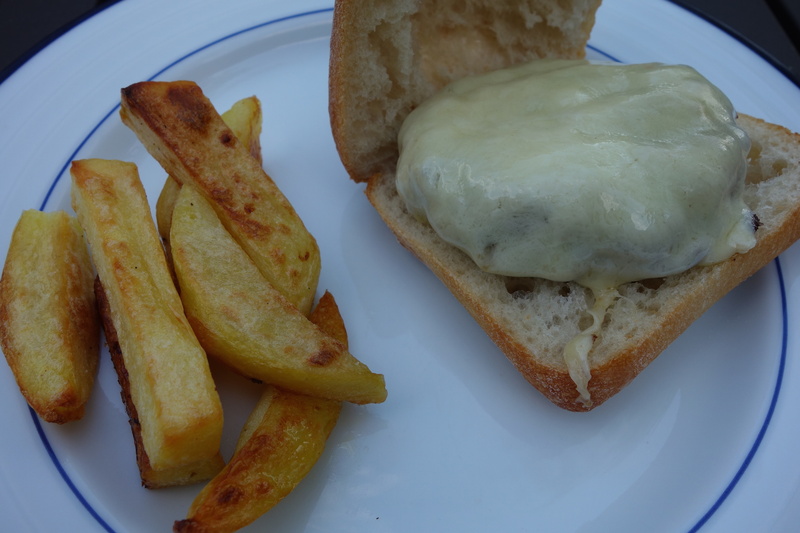 Grill and top with cheese and serve on toasted buns. So, these are perfect for Meatless Mondays! 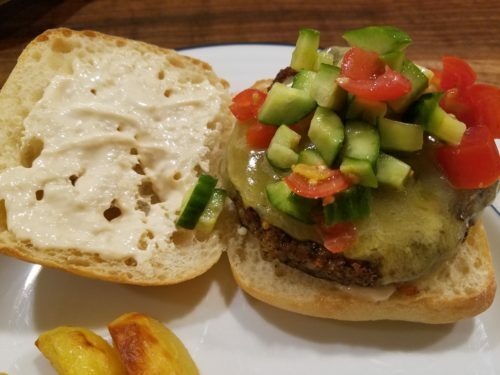 I’ve been meaning to try vegetarian burgers and paneer (Indian cheese) is the perfect thing to use. I grated the cheese and added a lot of yummy flavorings, including, cilantro, mint and dill! So, go get paneer (usually at Whole Foods) or definitely at the Indian store and try these! Mix all the ingredients together and refrigerate it for an hour. Form 6 patties and keep aside. Heat a large frying pan with the butter and olive oil. Brown the patties on both side on medium heat for 4 to 5 minutes each. Place sliced cheese, cover with foil for a minute or two and serve on buns with slices of tomato, arugula and cilantro mayo. Mix all the ingredients together and serve on buns with the burgers. Process the oregano, parsley, shallot and garlic in a food processor. Add the mixture to a bowl with the ground lamb. Add the salt and feta and mix and keep for an hour (it can be marinated the night before as well). Form into 6 patties and keep aside. Mix all the ingredients in a small bowl. Keep aside. 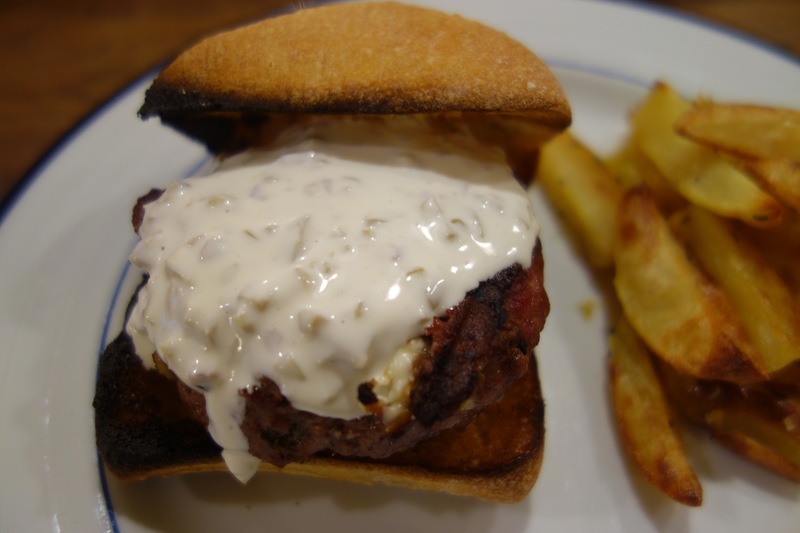 Grill the burgers and place them on toasted focaccia rolls. Add the olive mayo and serve with potatoes and a salad. Transfer the pork to a mixing bowl and keep aside. Transfer the green onions, cilantro, garlic and ginger to a food processor and process till chopped fine. Add to the ground meat. Add the gochujang, sesame oil, tamari, salt and egg. Mix well and refrigerate at least for an hour. Take out of fridge half an hour before making the burgers. Form into equal sized 4 to 5 patties and cook on stove or grill. 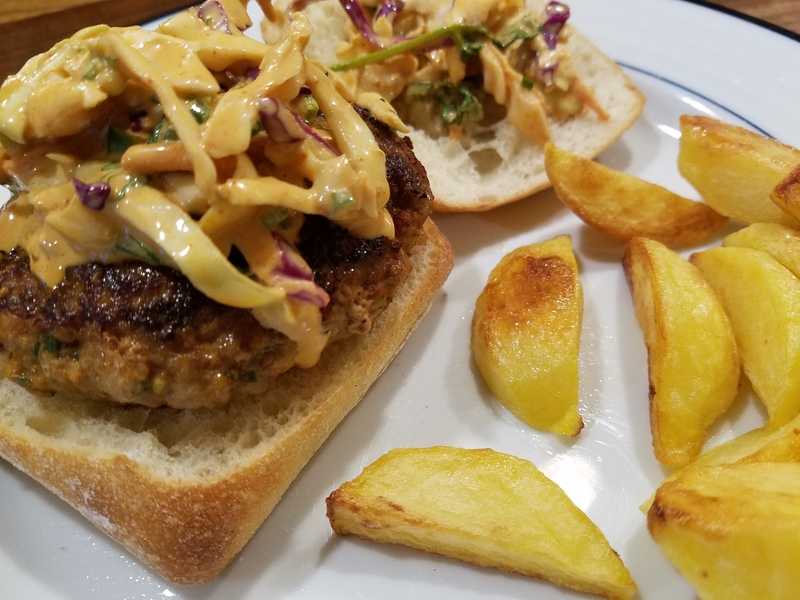 Serve on ciabatta rolls topped with the spicy coleslaw. Mix the gochujang, mayonnaise, sesame oil, tamari, salt and lime juice in a medium bowl. Add the coleslaw mix, jalapeno and cilantro. Mix well and check for seasonings. Serve on top of burgers. 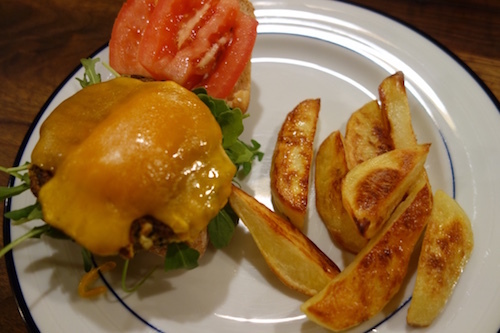 I’ll be posting burgers this week to get ready for 4th of July!! Heat 2 tablespoons of oil in a large skillet over medium high heat. Add onion, garlic, salt and cook until the onion is translucent about 2 to 3 minutes. Add the mushrooms and cook until soft, 5 to 10 minutes. Transfer the veggies to a food processor with the rest of the ingredients. Pulse 5-10 times to combine- careful not to overdo it… you don’t want a paste. Press mixture between fingers- if you can form a patty with it, you are good, if it is too crumbly, add some water 1 tablespoon at a time until it sticks together. If the mixture is too wet, add more breadcrumbs 1 tablespoon at a time until the right consistency. Form the mixture into 8 patties (about 1/3 cup of the mixture each) and place on a baking sheet lined with parchment paper. Refrigerate uncovered for 30 minutes. When ready to cook, heat 1 tablespoon oil in a large non stick skillet over medium high heat. Cook 3 to 4 patties at a time until brown, 3 to 4 minutes on each side. Add sliced cheese on top if desired. The left overs can be frozen. Serve in ciabatta rolls with tomato and cucumber relish and cumin mayo! Mix all the ingredients and let sit for ½ an hour before serving with burger. Mix all the ingredients and serve with the burgers.